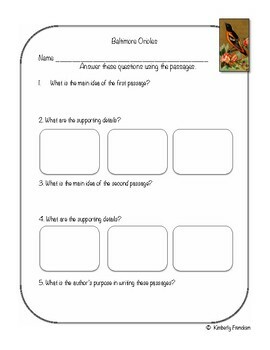 Perfect for close reading, a mini-reading lesson, for a substitute, or as part of a literacy center. A cover is included if you want to use this resource in the literacy center. Your students will love learning more about this vibrantly colored bird. Find out what they like to eat, how to attract them to your feeders, and how they build their unusual hanging nest in this 17 page resource. 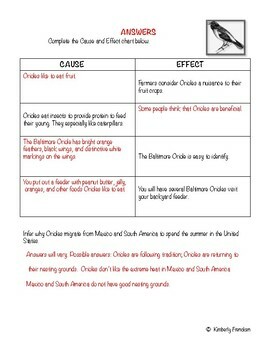 Included are: 2 informational text passages; a passage glossary; 4 printables covering context clues, cause and effect, main idea and supporting detail, using details to answer questions, and author's purpose; a how to use page; a how to prepare page; answer keys; and cover page. 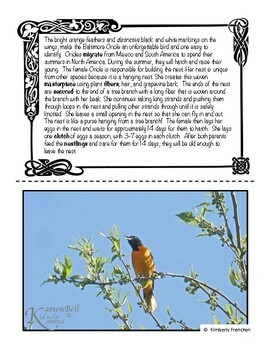 Poster quality photos are included so students can see what a Baltimore Oriole looks like. Take time to click on the preview. Look at my other Easy to Make and Fun to Use Literacy Center Ideas in my shop. For more pocket folder resources look at this nonfiction piece on horses!. 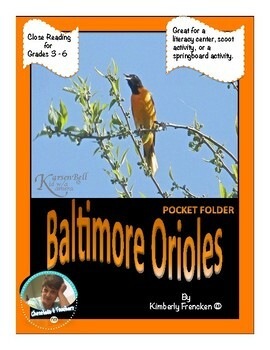 I have several non-fiction resources suitable for pocket folders like this one about hummingbirds!.